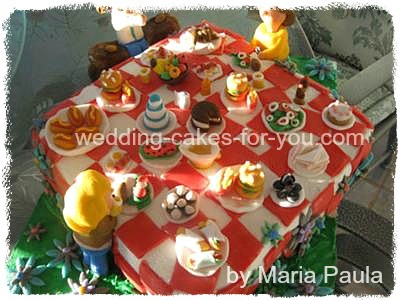 This page is a compilation of cake shares by Wedding cakes for You visitors. 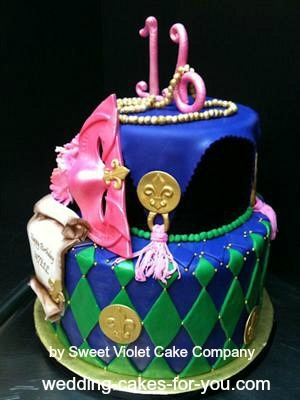 Starting with a gorgeous Mardi Gras Cake. This cake was made for a sweet 16 party. The theme was Mardi Gras. The young lady is very feminine and loved pink so we decided to feature pink as an accent color. The cake was pink velvet with vanilla butter cream. MY NAME IS LAURA MANSFIELD I NEEDED TO CREATE SOMETHING DIFFERENT IN THE CAKE WORLD AND AS I LIKE MODELING I DECIDED TO MAKE BERTI BASSETTE AND BECAUSE BERTIE NEEDED A COMPANION I THE MADE BEATRICE BASSETTE. ALL OF THE FIGURES I MADE WERE FROM MARZIPAN. ALL CAKES WERE FRUIT CAKES AND WITH JAMAiCAN RUM. THE ACTUAL CAKE TOOK ME NEARLY TWO WEEKS. I MADE A THREE TIERED WEDDING CAKE. AND WENT TO A WEDDING FAIR WHERE PEOPLE LOVED WHAT I CREATED. I THEN WENT ON TO CAKE AND CRAFT MAGAZINE. I RECENTLY GOT THE STAR PRIZE IN THE JUNES ISSUE. I WILL RECEIVE £40 OF CAKE DECORATING EQUIPMENT AS A PRIZE. I ALSO TOOK A BEGINNERS COURSE AND AN ADVANCED COURSE WITH MASTER CHOCOLATIER MARK TILLING. WHAT AN EXPERIENCE!!! I HAVE HAD THE SUGARCRAFT BUG FOR MANY YEARS AND I AM SO PASSIONATE AND ExCITED ABOUT WHAT I HAVE ACHIEVED. I WILL CONTINUE AND HOPE TO INSPIRE OTHER PEOPLE, AS I ALSO HAVE BECOME A TEACHER OF SUGARCRAFTING. WHEN MODELING USE A PRODUCT CALLED CMC. PUT HALF OF A TEASPOON IN HALF OF A POUND OF SUGARPASTE LEAVE FOR AN HOUR. WHEN KNEEDING THE PASTE IT WILL START TO BECOME ELASTIC. ITS THEN TIME TO USE IT. Thank you Laura for a great story and cake entry. What an unusual and interesting cake. Congratulations on the award from the crafting magazine too! My Grandaughter's Monkey Birthday Cake. The party was a monkey birthday theme. 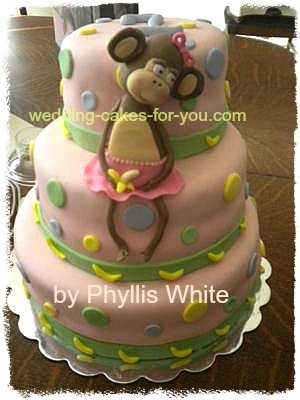 I wanted to make something very sweet, so I created a sweet little girl monkey sitting on the cake eating a banana. I sculpted the monkey out of fondant. It was a vanilla with banana pudding filling. I made a marshmallow fondant, covered the cake and made the decorations with the it. My granddaughters monkey birthday cake was a huge success. This is such a cute design! I love the blushing cheeks on the monkey! Absolutely adorable!!! Your detail is amazing! Fondant is something that I have never tried but after seeing so many fabulous cakes and what can be done with fondant, I definitely will have to give it a try! "This is so cute and pretty, luv the monkey girl...great job"
This is so adorable! and so clean. I love it! Thanks for being the first to enter the 6th Cake Decorating Contest. You have a very lucky granddaughter. I love seeing what other decorators are doing and hearing every ones stories. This is soooo awesome! I know how much work and love you put into that adorable Monkey cake. I would really love to thank you for this treasure and most valuable website. It has really helped me a lot. I joined a Wilton cake decorating course and we had to make fondant and roses. They taught us how to do the fondant and the roses but they didn't teach us how to make the cake because it's not part of the course. Your website really helped so much. I made the lemon cake which is the best and the yummiest cake I have ever tasted and I made the carrot cake. Thank you for your wonderful compliments! I am so glad that my website has helped you. Your cake is so sweet! I love the colors and the design. I hope you continue to make lots of cakes! Thank you for submitting this one to my contest. Feel free to enter again with your next cake. I will be continually running new challenges. Ask your friends and family to come and take a look at your work. I would love to see their comments. The process took me 3 days in the preparation for this cake...one day to bake and soak the rum syrup throughout the cut layers. Another day to cure. And then I made my delicious home made vanilla custard, divided it in half and made some chocolate as well. Then I used a chocolate drizzily fudge that I make that sets over each layer of rum soaked layers and filled it with my custards and my own buttery whip cream frosting. I decorated the 4 layer 9" morsel somehow they always taste better that way. 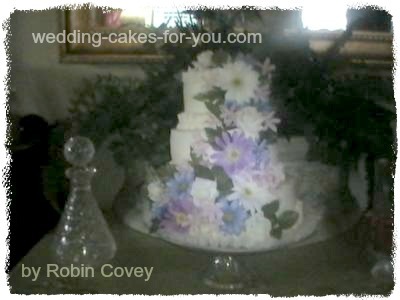 The cake was left to chill for the remainder of the day and then presented for a wedding cake tasting that evening. They were so impressed with the flavor I get the pleasure of making their cake in September. Just wanted to share not one of my prettiest creations, but one of my tastiest. I don't expect to try and win this awesome contest with all the other excellent works of art. I made this butterfly cake for a customer. She brought me a single napkin and asked me to make her a baby shower cake. So this was what I made. 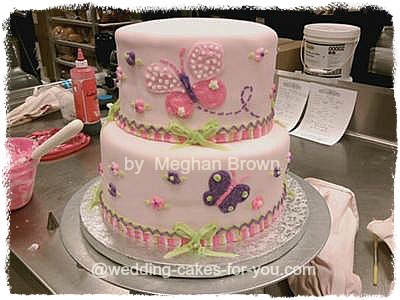 Very pretty butterfly cake Meghan! Thanks Brianne for the comment. Try the fondant I think you will find it fun. Very beautiful job!! I have not yet attempted a fondant cake! Looks great! How much would something as beautiful as this go for. Can you give me an idea please??? Thank you! Hi sorry i guess Meghan did not see your question. I can only tell you that prices vary greatly. It depends on the area you live in, what type, and how much decorating is involved. Some people charge for delivering as well. 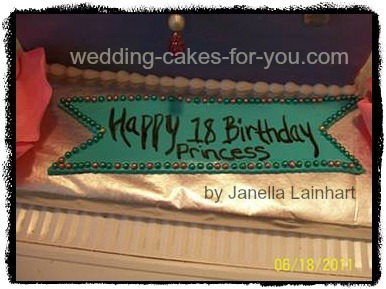 I made this princess pillow cake for a girl turning 18! Her Mom wanted to surprise her with this 3 tier cake. The beaded jewels are homemade and modeled with gumpaste covered in Dixie dust. I made edible sugar gems, using gem molds. I added gumpaste jewelry and the pillow was carved out of two cakes. Fondant was put on each pillow then put together! 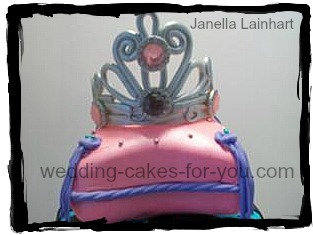 A tiara made out of gumpaste and sprayed with silver luster, sits on top of pillow decorated with pearl dragees. 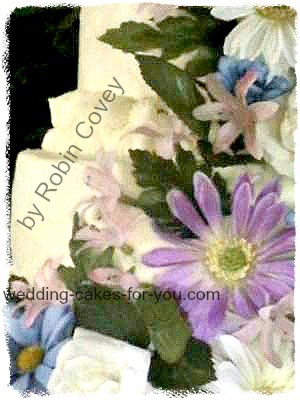 The flowers are all hand made out of gumpaste, using large tear drop flower cutters. The Zebra print was 50- 50 gumpaste and fondant rolled out thin and applied with a little water for glue. The flavors of the cake were, chocolate & white with buttercream! The b-day girl was so surprised when I delivered the cake. She called me later to thank me for making her cake and told me how much she LOVED it! 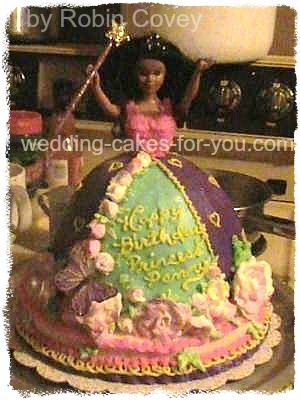 I really had fun making this cake, this was my first tiered princess pillow cake. My daughter wanted a princess cake this year so I bought a cake doll and baked up 5 delicious layers of classic white cake and filled it with cherry filling and after a few processes of icing and cutting and chilling here's the creation I designed. This is the cake that started it all for me. 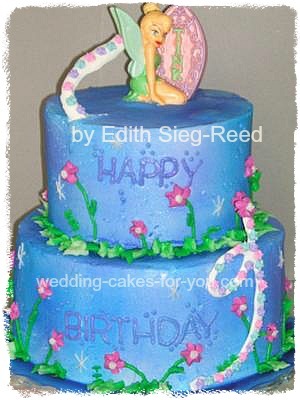 My 4 year old was begging for a Princess and the Frog birthday cake. I wanted to have something really special and not just a grocery store one with the plastic figures pushed in. So I went online and found everything I needed. Then watched a little YouTube, read some Colette Peter's books, labored in the kitchen for almost 7 hours...but in the end, she was beyond thrilled with Mommy's Princess And The Frog creation. 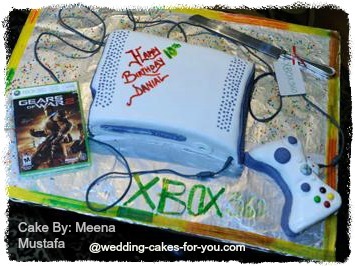 Whether as a wedding cake or a birthday, this is fabulous. Congratulations! What size layers did you use for the cake? Hi I'm answering for Connie in case she does not see this post. Looks like either an 8 and a 6 inch or a 10 and an 8 inch. Fluffy Vanilla cake with buttercream frosting. Cool use of cake sprays. 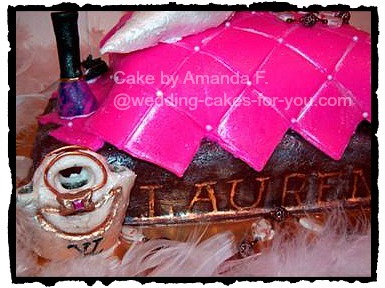 This cake was made for my cousin who loves Louis Vuitton pocketbooks and fashion in general. 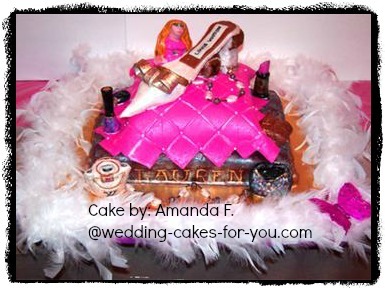 The cake has pocketbooks, lipstick, eyeshadow, nail polish and a mini version of her on top. The main attraction is the Louis Vuitton shoe on top. She absolutely loved the cake. The cake itself was vanilla sponge with fresh strawberry filling. Wow I love it. So fashionable. I love all of the details on your cake and it sounds delicious too. 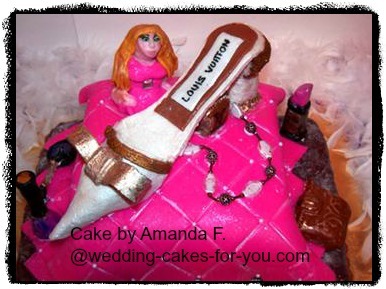 Thank you for entering this wonderful shoe cake design for a high fashion cake. 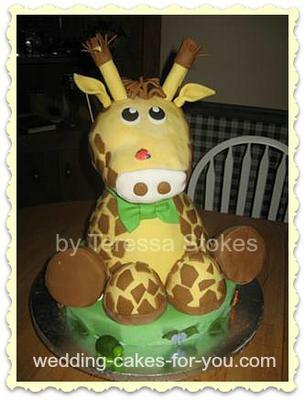 Thank you Tracy for entering your adorable giraffe cake in the cake decorating contest at "Wedding Cakes For You". It's really well done. You friend must have loved it. Can you tell us more? What flavors, what size and how you did it? 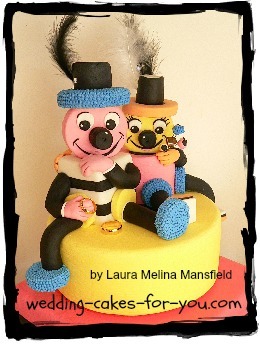 Did you use marshmallow fondant? I made this cake for my friend's little girl birthday. She's so cute and always have a big bow in her head. :) That's why she wants a big bow on top of the cake, and of course I love making bows it's so fun and easy. And always cute. Like ur color combination. U did a good job with the ribbon roses and that bow is gorgeous. 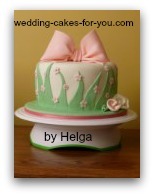 What a pretty cake, luv the pink bow on top of the cake!! Thanks Helga, It is so pretty. It's obvious you like to make bows. Very nice work. A friend of my mom's was leaving her work so she wanted me to make a cake for him. He was a nurse retiring from the ED so I made him a scrub top with all the supplies. It is chocolate with coconut pastry cream ....Enjoy! Love the bloody band aids!! Very original and I'm sure it made everyone smile. I was inspired to make a wedding cake out of the need to post another picture of my work on my website and such. I got creative and wanted to do a traditional small 3 tier stacked cake, so here it is. 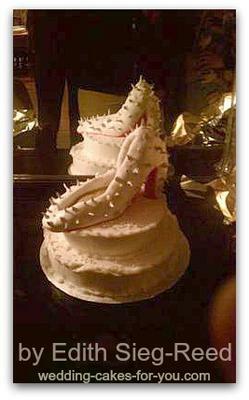 Thank you Edith for your spiked heel cake. Very cool! Can you give us some details on how you made these fabulous shoes? Using crispy rice cereal is so much easier to deal with; someone else mentioned, it is lighter than an actual cake as well. I'm sure one could carve out a shoe, but the crispie rice is so fun to play with. You almost have to overcook the marshmallows. By doing this, it makes the contents stick together better. I like to eat these delicious treats, but for the sake of molding, it has to be harder, so the marshmallows just need to be cooked longer. 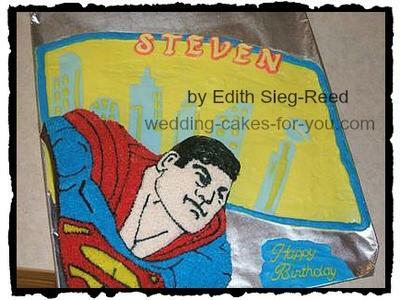 Superman cake! I am a nurse and a young man that has Down's syndrome was at the nurse's station talking about his upcoming birthday. I asked him what kind of cake would he want and he replied, Superman. His enthusiasm prompted this cake. The look of surprise and all the hugs and thank yous from this special guy was priceless! The fondant back drop was my first, so I was delighted in it turned out. 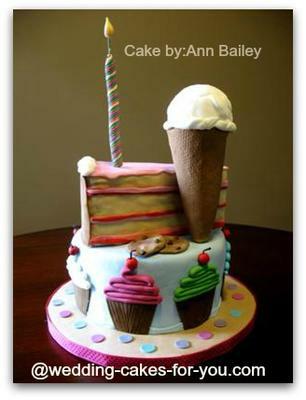 Thank you Edith for yet another great entry into the cake competition. What a nice thing you did making the superman cake for this little boy. This picnic cake was made for my mom and her friends. They love to have picnics, talk and eat really good food. So she asked me to make a cake that represented her friends and of course her. Here is what I came up with. 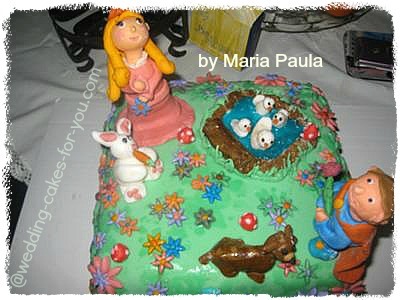 A cake with her and her two friends enjoying a picnic. 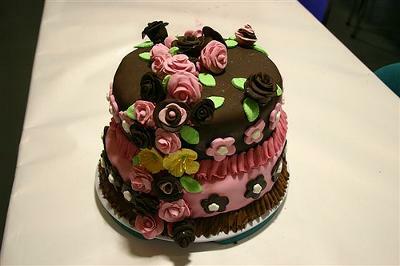 It is a chocolate cake with icing on the top covered with rolled fondant, fondant flowers and fondant figures. I like this cake because it can be used in every occasion. My mom and her friends loved the cake so much they did not want to cut it. I felt all my hard work has paid off with my picnic cake. 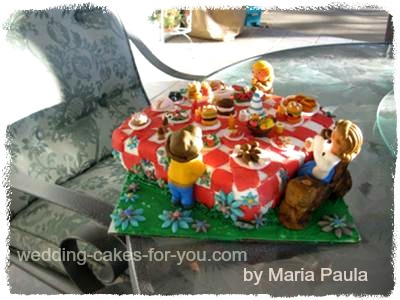 Hi Maria, Thanks for entering your picnic cake. very nice job. I love all of the little miniature foods. I am new at this cake thing so I don't know that much. I was wondering how you did the tablecloth. Is that fondant, or did you use food writing markers? My work place is having a picnic and I'm doing a cake. I thought of doing something with this tablecloth pattern. This cake is amazing!! hello eva how are you?? I just paint the fondant with food coloring and cut it with a cookie cutter. so just go in youtube and search for my channel name. Thanks Meena Your cat birthday cake is great! Very unique idea. This is one amazing creation. Thanks for sharing this feline-lover's view of a comfy setting. The detail work is phenomenal! Fantastic! Clever idea and good color choices. "What an adorable cake and all those cats are so cute!!." This is my favorite cake since I am a cat lover. Lots of hard work for fine details. 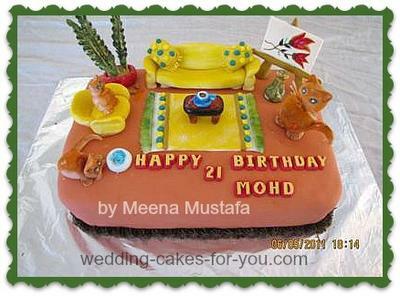 I am sure Mohd loved it. So great,I had a piece of my birthday cake from Meena and always wish to have some more, Thanks so much for such amazing flavor. It looks marvelous and I hope it tastes the same. It depicts the wonderful artistic sense and great skills of its creator. Simply superb and awesome. 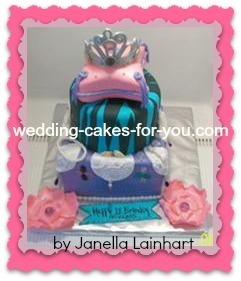 I hope you like my princess party cake. Hi Maria, Thanks for your entries. You do amazing work. 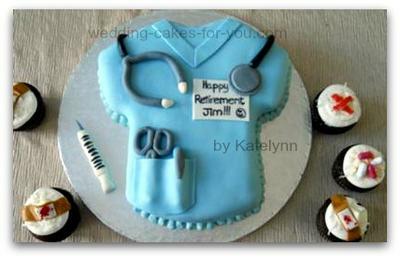 You must spend many hours making your fondant figures. 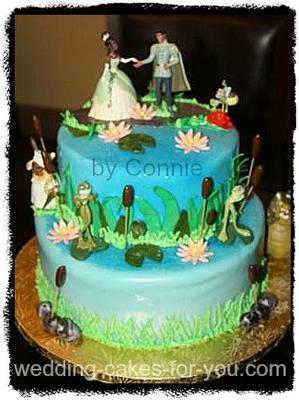 This cake is really sweet and thoughtful, it looks like it was brought straight out of a scene from a princess movie. This pumpkin graveyard cake has a delicious double chocolate as it's base layer, topped with Hershey's chocolate icing and Oreo cookie crumbs. 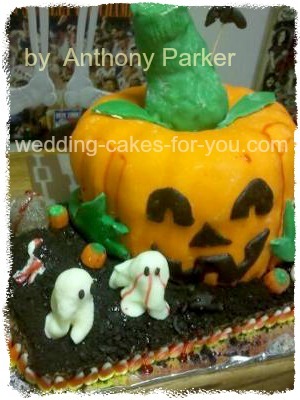 The Pumpkin is made of a delicious yellow cake recipe topped with orange and green fondant, with dark chocolate for it's face. Also on this wonderful cake are a variety of Halloween decorations all made from white and dark chocolate which include ghosts, rat, eyeball, skull, tombstone, and a bone arm coming out of the grave. Wrapped around the cake is candy corn and a few mellow creme pumpkins. This was so good and very festive...and so much detail! Great job!! Very creative, and it tasted very yummy too!! Looks amazing. The detail is really good especially the stem. Keep up the good work. Can imagine it tasted as good as it looks . As somebody that attended the Halloween party and actually saw it and tasted it in person, this was without a doubt the best cake I've ever had. It was even better than some wedding cakes I've had in the past. 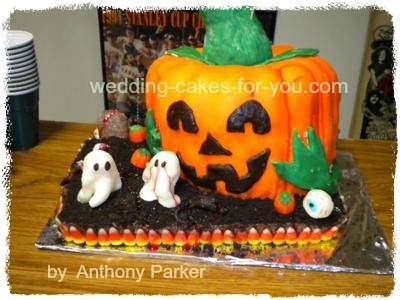 Anthony, Thank You for your awesome Pumpkin Graveyard Cake entry. Very cool. I am sure it tasted great too. Good Luck! let everyone know about your entry so they can vote and comment. This "I Love Sweets" cake was made for a young girl whose mother said she couldn't make up her mind what kind she wanted. She went back and forth between an ice cream one to chocolate cupcakes to strawberry shortcake. So I thought it was a good idea to combine all of them into one. The ice cream cone is made of rice Kripsie treats and the slice of cake on top is strawberry with fresh strawberries inside. 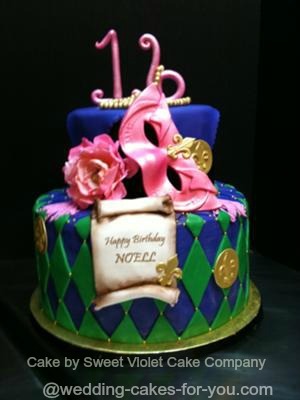 The bottom is a triple chocolate fudge with chocolate ganache, covered with fondant. I decorated the bottom tier with fondant cupcakes flavored with amaretto. I had fun making it and the young girl and mother loved it. Thank you Ann for a great entry! The idea is very unique. Love it. Hope it gets lots of comments and ratings. For Thanksgiving, I wanted to make a cake that would wow my family and friends but also represent the holiday. I have done various turkey themed deserts, so I decided to do something different: The Mayflower. The base is a regular half sheet. I dyed buttercream an ocean blue and spread it on generously. Using my flat spatula, I went over the icing in a rocking motion to replicate the sea, creating a wave effect. For the boat, I baked a cake in a bread pan. I knew this would give me a dense and oblong cake (similar in structure to a ship) without much carving. Once the cake cooled, I cut off a rectangle piece (the last sixth of the bread-pan cake). I put that on top of the end of the cake to create height and secured it with frosting. I then began carving the ship. I rounded the back. At the front of the ship, I carved it to a point and slowly angled downward. Once completed, I dirty-iced the ship. Next, I covered it in a light brown and added a piped border in a slightly darker brown. For decorations, I piped three stars on either side of the ship as well as on the back. I cut 5 small marshmallows in half and placed the sticky side on top of each star to act as windows. For the ship's sails, I used 3 pretzel rods, cutting two of them to be shorter than the middle sale. Lastly, I cut three squares from edible paper and punched holes on either side placing them over the pretzel rods. Voilà! 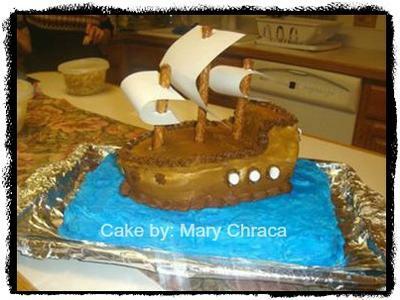 Thanks Mary, I love your Ships Ahoy cake design, You gave a couple of great decorating tips too. Love the pretzel rods and edible paper sails tip. And the frugal: baking tip. Thanks for entering the cake decorating contest. Good luck and may you get lots of comments and ratings. Family and friends were coming to celebrate my baby boy's Christening and I wanted to make a cake for the occasion. When I began to think about the type I was going to make I decided that I wanted it to symbolize certain aspects of his special day. Since it was a baptism I wanted to show both innocence and purity. I decided to use chocolate to represent the innocence of children (what kid doesn't like chocolate? ), and white flowers to symbolize the purity and tranquility of a newborn. For the bottom tier I used yellow with chocolate ganache' and vanilla meringue filling (which took 2 attempts to make it correctly). The upper tier was chocolate with chocolate ganache'. The dogwood fondant flowers were brushed with petal dust powder to make them appear realistic. The best compliment I received was it was as delicious as it was pretty. 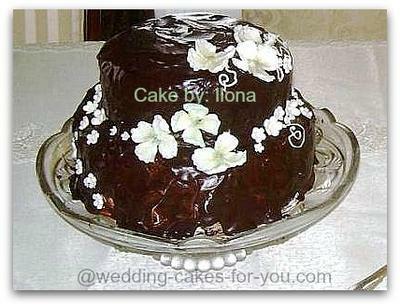 Thank you Ilona for submitting your beautiful Chocolate Baptism Cake. It is very sweet. The fondant flowers are very well done too :-) and it looks so yummy. Your baptism cake looks sooo yummy! Great job!! I just entered the contest myself, but I should have read the other submissions first. I'm not a writer, that's for sure! I love how you talked about innocence and purity and that it influenced how you pick the colors and flavors! Thanks Meena for your contest entry. 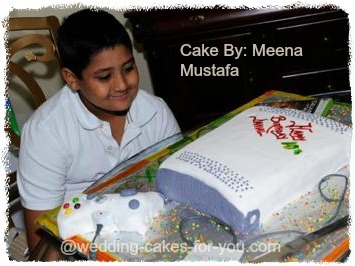 Your son looks soooo happy with his x-box cake. 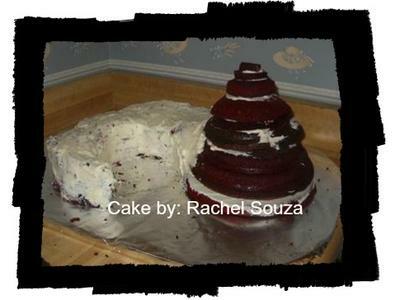 I used 4 boxes red velvet cake and part of a big top cupcake and two sheets, to start. I shaped and cut then with homemade frosting crumb coated then let dry a bit. Then started the mass creature and was done 3 hours after decorating. I had used sprinkles for his eyes. My Son loved his Birthday surprise!!! I never thought i could get hungry looking at jabba. Great job. I am sure that this made both Matt and Jakob feel proud. You took one of their favorite things and made it into CAKE!! It looks just like jabba the hut.......only edible. Great job!! This is SO creative - I love it!! 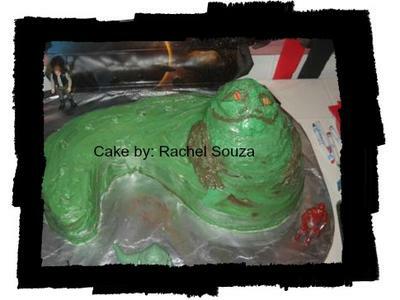 Jabba as a Cake so Great! !